Melbourne Heritage Action has written the below objection to the proposed demolition of the Theosophical Society Building on Russell Street, for a glass clad ‘micro-hotel’. 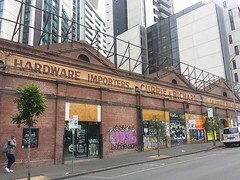 Alongside side this we are urging the City of Melbourne to ask for interim protection for the building, as it may be found to have precinct and individual significance in the upcoming Hoddle Grid Heritage Review. Objections can be sent to planning@melbourne.vic.gov.au , with the reference number ‘TP-2018-52, 124-130 Russell Street, Melbourne’ quoted. Melbourne Heritage Action wishes to object to the complete demolition of this building, and propose that instead that an Interim Heritage Overlay be applied, and that at least the front portion of the building be retained in any development. We are concerned to see yet another historic building, a quite prominent one in a relatively intact area, and with some obvious architectural qualities, is lacking heritage protection. It is yet another example of the many places caught in the gaps between the last adopted heritage study back in 1984 and the upcoming Hoddle Grid Heritage Review. While the building has no current heritage protection, it may well be found to be individually significant in the upcoming Hoddle Grid Heritage Review. We have also made a submission as part of that review that it would be contributory to a new precinct centred around Bourke and Russell Streets, which may also be a recommendation of the study. If either of these are in fact being considered, we urge council to negotiate an outcome that preserves at least the front portion of the building. It was built in 1923 by Russell Investments Proprietary Limited as an investment, with office space above, and a car show-room for on the ground floor. This showroom was occupied by Olympia Motors from 1923 to 1935, then other car sellers until WW2. After WW2 the showroom was occupied into the 1950s by National Cash Registers. The use of the ground floor as car showroom is almost the last physical reminder of the many automobile functions that concentrated in this area from the 1910s to the 1960s. Preston Motors once occupied the southeast corner of Russell and Little Collins in a notable art deco showroom (dem in the 60s), while recently demolished building on the south west corner was used by various car sales companies such as Kellow Falkiner. The only other reminder still extant is the Little Collins Street façade of the 1938 Victoria Carpark (which included car-servicing facilities), which had an entrance on Russell Street, also recently demolished. Architecturally, the stylized classical decoration of the original 1923 façade design is intact, including wreaths marking the central stairwell and more modest patterns typical of the era around windows and cornices. The only alteration is the replacement of the window frames with aluminium ones, a change that is easily reversible. Sometime after the motor show room vacated, the ground floor was converted to shops, and in 1963 Lewis Music moved in, making its continued presence in this location one of the oldest surviving small businesses in the City of Melbourne. 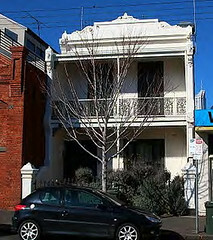 The building was substantially altered on the ground floor and interiors in 1975, after its purchase in 1972 by the Theosophical Society, who had relocated from Collins Street. These changes brought the current modernist ground floor tiles, display windows, interior lecture theatres (largely intact), as well as clever insertion of the Theosophical emblem over one of the original wreaths on the second floor (and a more elaborate version below the canopy). Overall the modest 1920’s building with 1970s additions presents a layering of historical uses, which adds to rather than detracts from the buildings historic importance. The building is currently home to modest-rent community and health organisations, a bookshop, language centre, retail, and a 4d cinema inside the lecture theatres. Having made it their home for over 45 years, the Theosophical Society is the longest term occupier of the building, and their loss is to be regretted. Gold mosaic style facades and wood panelling are rare survivors of mid 70’s commercial style in the CBD. MHA have suggested previously and again as part of the Hoddle Grid Heritage Review a heritage precinct centred on the intersection of Russell and Bourke Streets. This would encompass an area overwhelmingly composed of pre WW2 smaller retail and office buildings, many of which are already individually listed. Our suggested boundaries would encompass this building, as well as the adjacent 1954 Post & Telegraph building and the Kelvin Club in the (individually listed) 1871 warehouse to the rear on Melbourne Place. We believe this area is almost self-evidently a very good candidate for a precinct HO. The proposal as it currently stands seeks to completely demolish the current building for what appears to be large glass walls facing directly onto the street without setback, inserting a modern development into a streetscape and precinct dominated by masonry and fine grain. This is in contrast to other nearby redevelopments such as the Hero Apartments next door, which converted an historic brick building in award winning fashion with top level additions, and the recently constructed QT Hotel opposite, which is a solid neo-Brutalist design that complements the streetscape. Besides the loss of historic built fabric, this proposal will see yet another of Melbourne’s low-rent commercial spaces, and community/creative hubs removed for private residential and hotel purposes. This follows similar unfortunate developments nearby such as the hotel which will preserve only the facade of the once-vibrant Palace Theatre in Bourke Street. the currently proposed replacement hotel. Preferable to the current proposal would be one that at the very least retains the front portion of the current building and signage indicative of its historic association with the Theosophical Society, Lewis Music, and other previous uses. Ideally a hotel proposal could be achieved much like the Hero Apartments next door, with a rooftop addition and some conversion, while also retaining some use of the building for community or social purposes including an intact ground floor with hotel entrances via the laneway to the rear. Whether or not council applies for interim protection, we would like to see some form of lobbying and negotiation with the developers in order to signal that social heritage as well as built heritage is important to the City. There is overdevelopment in the original melbourne cbd. Buildings with historical and architectural significance should be preserved. The council should allocate modern development for areas outside the cbd. This situation calls for a creative architect intelligently briefed. Unfortunately no one has the power to request a better architect. Is the proposed architect known?